Beauty is still a huge part of my life but I look more closely now on the things I buy for myself. Spending wisely often mean getting the best than looking for the cheapest. Quality of quantity for this instance. So unless your income can't really take it, don't feel bad buying something nice (but effective!) for yourself! When I saw Snow Skin Whitening ads circulating around media and saw some of my friends try it, I thought it was just a regular run of the mill whitening lotion. But giving it a closer look, Snow White Lightening Lotion and Cream proved to be a worthy contender for the general mass-marketed produced whitening lotion. The name Snow White was came about because this body lotion has 7 active ingredients that were proven to work. And these 7 ingredients and the amounts of it in every exactly what makes this a top of the line but affordable body lotion! TIP: If you're looking for a great (not just good) whitening skin care or body care, look for ingredients that inbihits tyrosinase in our skin. Tyrosinase causes melanin production that causes our skin to darken. Reading through the 7 ELITE ACTIVE ingredients list of Snow White Skin Whitening Body Lotion and Cream, I was getting more and more impressed! These are the ingredients you want to see when your goal is a fairer, softer and younger looking skin. So allow me to be technical because I am incredibly amazed with these ingredients! Naturally melanin is a good thing. It's our body's way of protecting our skin. But as we age, our melanin production gets wonky and so we end up with darker skin that is uneven-looking. Patse-patse would be the best term to define this skin dilemma and it's not at all flattering.And to my surprise, science and technology has discovered that these naturally derived Tyrosinase-inhibitor breakthrough ingredients do not only control Tyrosinase but also protect our skin from harmful UV rays and prevent aging! I can't tell you enough how important a tyrosinase-inhibitor ingredients are because they are the most effective and fastest way to skin whitening. So before carting anything a celebrity is endorsing, pay attention to the ingredients and don't allow yourself to be ripped off products that have little whitening ingredients in them. So how can I not be impressed with Snow White Skin Whitening Body Lotion and cream wen it's heavily backed up with science and research in every step of the way? And as I continue to use it, there is undeniable results! My left arm which is more exposed to the sun when I drive is now almost the same shade my right arm. There is already fading on the tan lines I acquired from a pool party I hosted two weeks ago. My stretch marks and CS wound is significantly lighter, especially the stretch marks around the bum area. It faded the marks on my legs that used to have marks from chicken skin. *These results are from one month usage. Aside from these results, Snow Skin Whitening has topped my usual lotion in other ways! It's Hydroquinone-free which is not best for sensitive skin. Hydroquinone is popular whitening ingredient but it usually causes stinging and peeling that can turn to skin trauma. It's Paraben-free that will suit even women/men with sensitive skin. It comes in a posh white cylindrical container and air-less pump and it looks really fancy on top of my pearly white dresser. It dispenses just the right amount of product needed for a specific area. Don't be fooled by it, a little goes a long way. It smells awesome! Love the powdery fresh scent... and it doesn't linger so I can use any perfume without worry it would mix with it. It gets absorbed easily on to the skin leaving no icky after-feel. Great for Summer when we all need sun protection and maintain our fair skin. Best of all, the lotion is only P799 and it can last 3-6 weeks of use for petite person like me. The cream is only P1,299 and will last far longer when used only on targeted areas. I think I found my holy grail lotion in Snow White just because of the elite ingredients. It's been awhile since I was impressed with a lotion and Snow White just swept me off my feet! You can't beat a product that's backed up by science and actual results! This lotion and cream means business and that is giving you the fairest skin if them all. 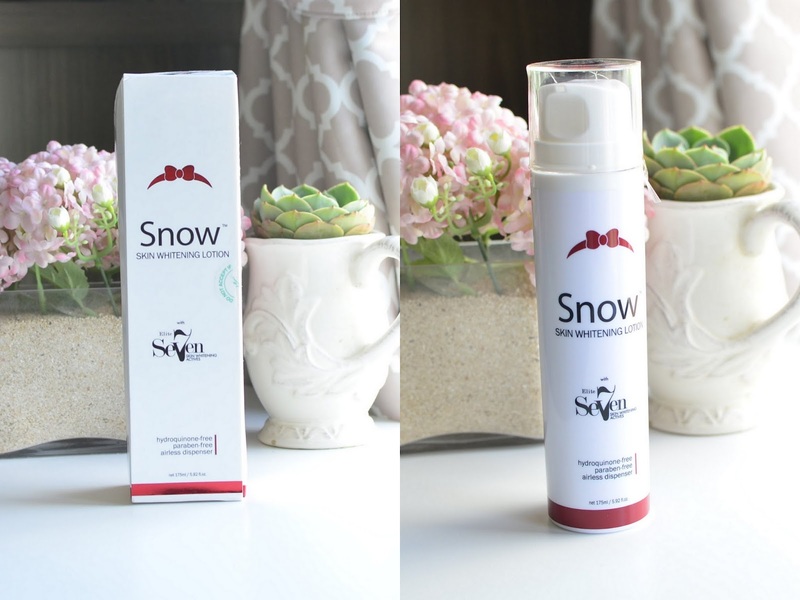 Snow Skin Whitening is definitely mommy-approved and beauty blogger-approved!